I remember when I was younger, my family would travel to my grandparents’ house to visit during the summers. I can only imagine the hours of planning, shopping, and baking that occupied my grandmother’s days prior to our visits. She always had carefully planned meals, and an array of baked breads, coffee cakes, and other goodies to share with us. 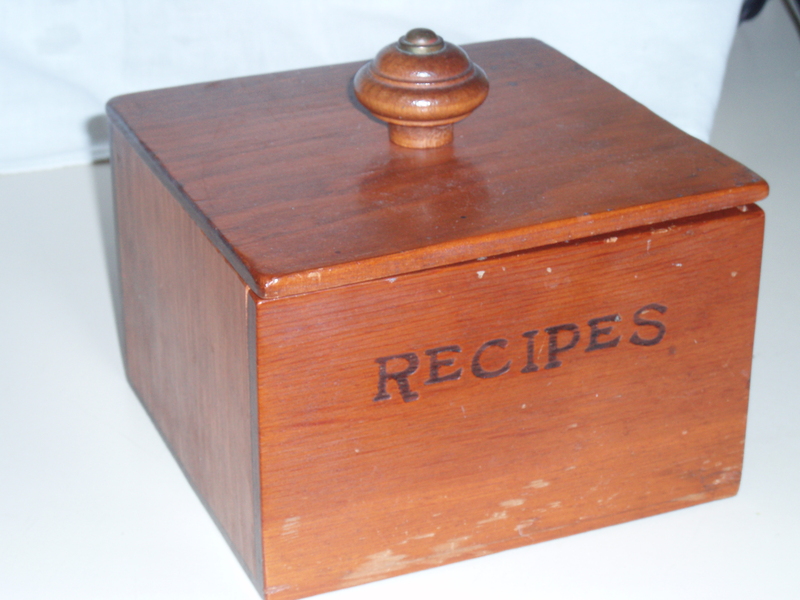 When my grandparents were downsizing their home recently, she gave me her recipe boxes and other recipe books. I spent hours reading every recipe she shared with me, carefully noticing how some of the recipe cards showed signs of repeated use (including spots, or her hand-written notes). (Those are the GOOD ones!) 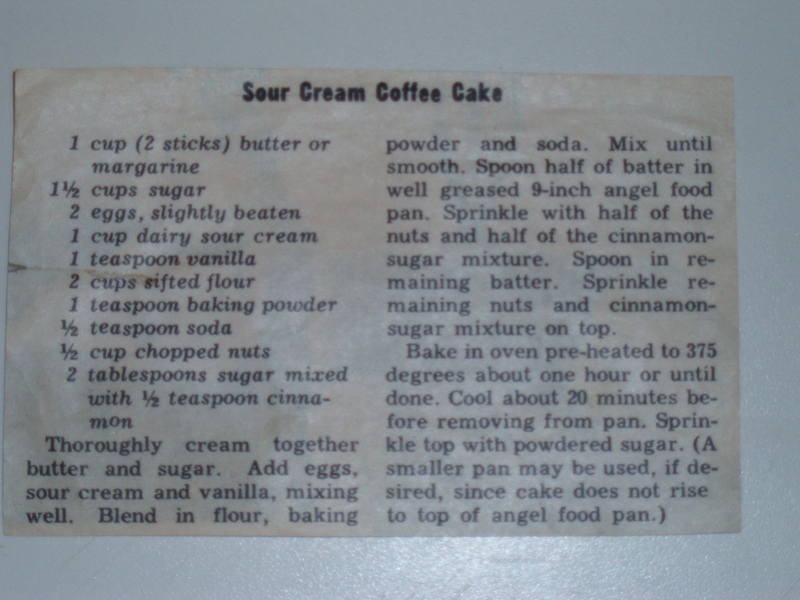 Her recipe cards included not only handwritten cards but also many a newspaper clipping. I thought, what better way to enjoy what she shared with me than to create some of the goodies described in these recipes! 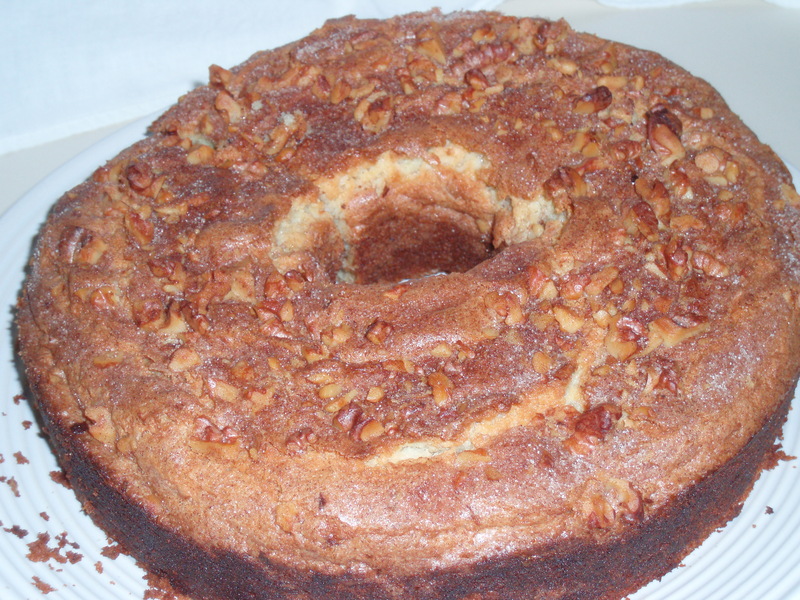 Sour Cream Coffee Cake is one of those recipes found in Grandma’s recipe box. The only change I made was to reduce the baking time (it was done in 47 minutes for me). It came out wonderfully moist and crumbly, with a crispy sugary-cinnamon crust. Yummy. Thoroughly cream together butter and sugar. Add eggs, sour cream and vanilla, mixing well. Blend in flour, baking powder, and soda. Mix until smooth. Spoon half of batter in well-greased 9-in angel food pan. Sprinkle with half of the nuts and half of the cinnamon-sugar mixture. Spoon in remaining batter. Sprinkle remaining nuts and cinnamon-sugar mixture on top. Texas doesn’t get fall weather…we have hot, not-quite-so-hot, and then all of a sudden it gets chilly for a day or two. I keep waiting for those chilly days to stick around, and we’re not quite there yet. Alas, I felt I would get more into the fall mood if I roasted some lamb and had a glass of cabernet. 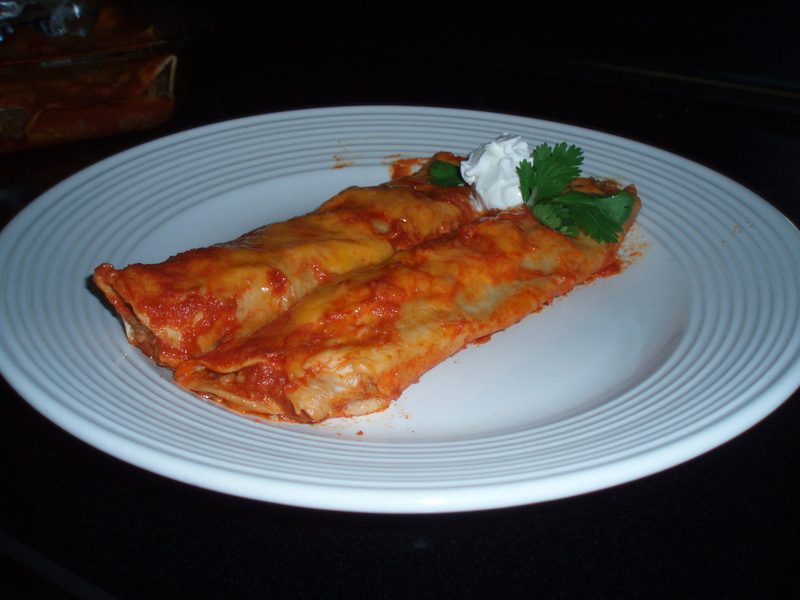 This recipe is adapted from Gourmet magazine. 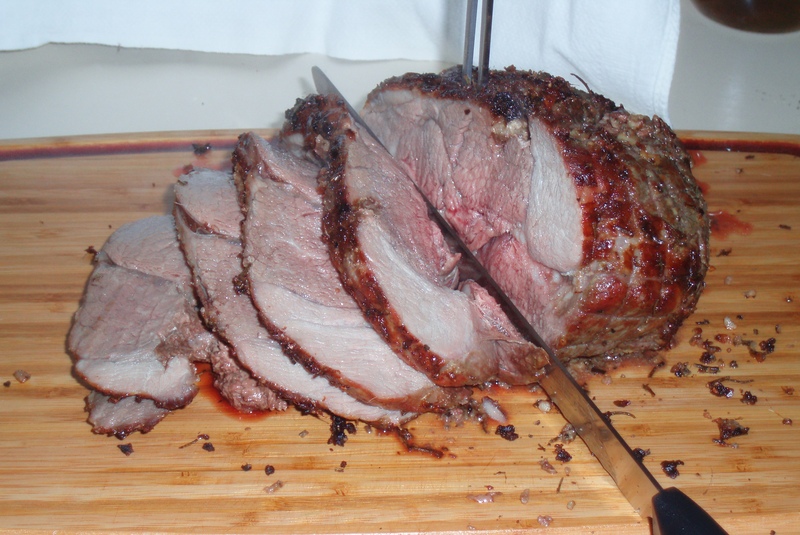 I think it’s a wonderful, savory way to enjoy a lamb roast. I served it alongside some baked acorn squash and steamed asparagus. Tasty eats indeed! Chilly weather or not, it’s fall at my house! Preheat oven to 400 degrees. Sprinkle lamb all over with salt and pepper, and then roast in a roasting pan with rack until a meat thermometer registers 125 degrees for medium rare, 1 ¼ to 1 ½ hours. Let stand 20 minutes before slicing. Which brings me to Wednesday night. My friend Nicole and I attended a cooking class hosted by Tre at Central Market in Plano, Texas. 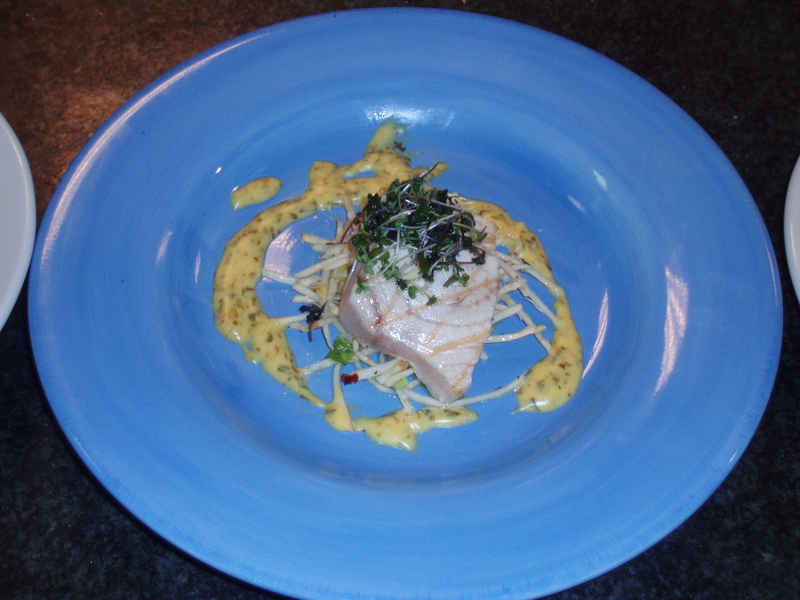 This was my first cooking class…ever…and so it was a great way to initiate myself! I was a bit starstruck (ok he probably wondered why there was this crazy chick taking multiple pictures of him while he was trying to talk…) I also furiously wrote down notes on top of the recipes he provided for us. He prepared: Seared Sea Scallops and Bacon-Scallions with Pomegranate Brown Butter, Grilled Swordfish with Celery 3 Ways and Bernaise (my favorite! ), Monkfish “BLT” with Fresh Avocado, and for dessert, a wonderful Strawberry-Rhubarb Soup with Vanilla Foam and Sweet Basil (with a splash of champagne in it). Let me tell you, the food was simply wonderful. But what a wonderful experience! If you ever are wondering what to do one evening in the Dallas area, and you like cooking, I encourage you to check out the cooking classes at Central Market. Tre actually teaches there quite often, and it’s a treat.